Captain Wayfinder, a Nord rogue, recently inherited the Sea Squall from his late mother and named himself captain, despite an obvious lack of experience. 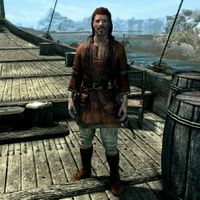 The ship is currently docked in Dawnstar and is inhabited by Wayfinder and his small crew. Recently, Wayfinder's crew managed to lose an important shipment from the College of Winterhold and will ask for your help. Wayfinder spends all of his time wandering around on the deck of the Sea Squall, at times conversing with his two crewmembers, Guthrum and the particularly bitter Ravam Verethi. With the ship permanently docked, Wayfinder spends his time eating, drinking, or sweeping the deck. He never sleeps or leaves his ship. Captain Wayfinder wields a steel sword and wears a set of merchant clothes with matching boots. He carries a random selection of common items and gold. When you meet him for the first time, he will say, "Everyone thinks I'm too young to be a ship's captain, but I'm going to prove them wrong." He also reveals a genuine interest in his crew: "I don't buy all that talk about ship captains having to be stern and strict. I want my crewmen to enjoy their work." He will also admit his lack of experience: "I'm good with stars and charts, but I admit I've got some things to learn about leading men." Lastly, he will tell about how he ended up on the ship: "I inherited the ship when my mother passed away. She spent her life on the water, and now I do, too." When you ask him if he is actually the captain, he will say: "By inheritance, as my men are fond of saying. Can't blame them, my mother ran the Sea Squall as strictly as she ran the house. I've been trying to find new areas of business, trying to win the sailors' respect, but I keep having problems. Take the last trade we did. Some Fine-Cut Void Salts from the College of Winterhold. Plenty of coin if you know who to sell it to." When asked what happened to the salts he will start the related quest with: "Sailors are what happened to them. They got drunk and ended up losing the merchandise in some cave. If you're not afraid of a little exploring, I'll pay good gold to get those salts." When you return with the salts, a grateful Wayfinder will say, "That's the first bit of good news I've had since I set sail a year ago. Here's your cut." and hand you a leveled amount of gold. According to game data, his first name is Leif. This page was last modified on 30 August 2015, at 14:26.